For patients who spend long stretches of time lying down, the use of a proper pressure relieving mattress is crucial to prevent the development of pressure relief sores. The Harvest Prime Comfort Plus High Risk Pressure Relief Mattress provides excellent pressure distribution with high quality foam, and is equipped with keyhole slots to allow use with profiling beds. 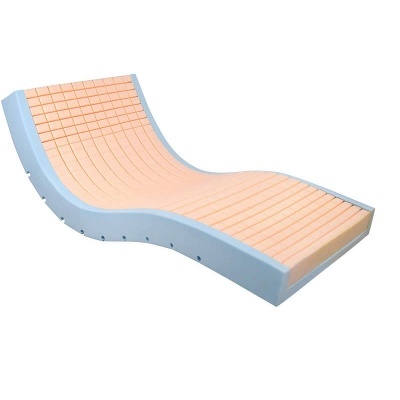 With a castellated foam top layer to prevent the patient from overheating, this mattress is suitable for those at high risk of pressure sore development. Built with two layers of high quality foam, this mattress is able to provide complex and versatile support to the patient. The foam is supported by a high density base and U-shaped side wall construction, enhancing stability and assisting in patient transfer. A castellated foam top allows excess heat to escape from underneath, preventing the patient from overheating. Keyhole slots in the high density base allow this mattress to be used with profiling beds, making it highly versatile through a number of medical scenarios. The castellated top layer also allows the mattress to form the body shape of the user, creating a specifically-tailored experience for each patient. This mattress has been reinforced specially to be suitable for use by virtually any patient. With excellent pressure redistribution, this mattress can support patient weights up to 247kg (39 stone), allowing even bariatric patients to experience excellent pressure distribution. To protect the mattress, it is supplied with a two-way stretch, vapour permeable PU cover that is waterproof to guard against spills and fluids. Welded seams ensure the cover is durable, while the breathability keeps the patient cool and free from sweat that could exacerbate friction and shear forces. This fully sealed cover ensures the mattress meets specialist requirements and is suitable for use in mental health units. The high frequency welded seams reduce the possibility of fluid ingress and improves infection control.